NOAA, the National Sea Grant Program, the United States Lifesaving Association, and the National Park Service want you to have a safe and enjoyable time at the beach or seashore. 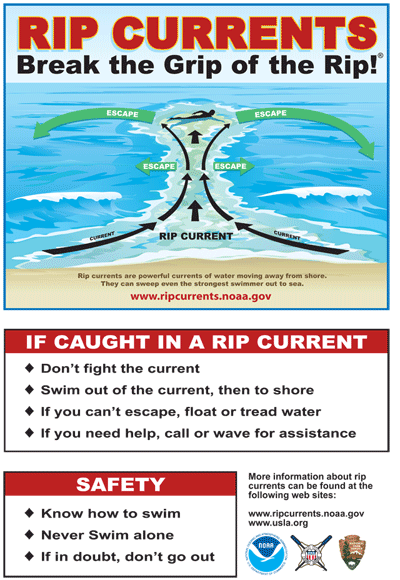 In an effort to heighten public awareness of rip currents at surf beaches, each year NOAA designates the first full week of June as national Rip Current Awareness Week, coinciding with the traditional start of the summer vacation season. Rip currents are strong narrow currents moving away from shore. The strongest rip currents can attain speeds reaching 8 feet per second; this is faster than an Olympic swimmer can sprint! On average, more people die every year from rip currents than from shark attacks or lightning. According to the United States Lifesaving Association, 80 percent of surf beach rescues are attributed to rip currents, and more than 100 people die annually from drowning in rip currents.